97% of climate models say that 97% of climate scientists are wrong. Yet we base, literally, trillions of dollars of other people’s (taxpayers) money on alarmist climate change policy, schemes and rent-seeking scams (windmills/solar) on overheated, predictive models that do not observe climate reality. CMIP5 IPCC climate models don’t even ‘model’ clouds, the sun or ocean currents (AMO/PDO). What possibly could go wrong? /sarc. RCP8.5 BS in = Alarmist BS out. 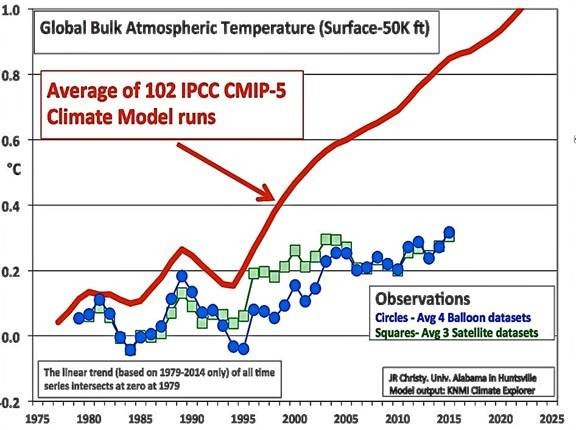 It’s no wonder ‘Climate models don’t work’! In February 2016 climate scientist Dr. John Christy presented testimony to Congress demonstrating that climate models grossly exaggerate and over estimate the impact of atmospheric CO2 levels on global temperatures . Dr. Christy noted in his testimony that “models over-warm the tropical atmosphere by a factor of approximately 3″. NOAA climate activist scientist Dr. Gavin Schmidt challenged Dr. Christy’s work claiming that it was “partisan” and using vague statistical arguments claimed that Christy’s work improperly presented the performance of climate models. These claims by government scientist Dr. Schmidt peaked the interest of statistics expert Steven McIntyre who was one of the most prominent experts to expose the flawed science (proxy shenanigans) and mathematics (statistical errors) behind the now disgraced thousand year long global temperature profile infamously known as the “hockey stick” (https://climateaudit.files.wordpress.com/2005/09/ohioshort.pdf).